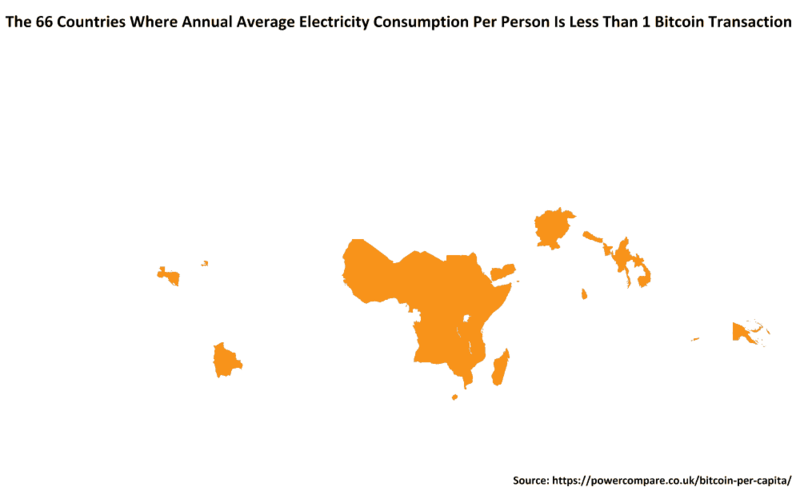 The map above is a world map only showing countries who’s annual average electricity consumption per person is less than that used to perform 1 Bitcoin Transaction (819 KWh according to the Bitcoin Energy Consumption Index). 66 countries/territories consume less electricity per person per year than that used for a single Bitcoin transaction (819 KWh at the time of writing). Over 1.5 billion people (20% of the World’s population) live in these countries which include: Pakistan, Bangladesh, Nigeria and Ethiopia. It takes an estimated 94,000 KWh of electricity to mine one Bitcoin, which is almost double the average annual consumption per person in Iceland, which has the world’ highest per capita electricity usage. Mining one Bitcoin would also be enough to provide electricity for approximately 6 Canadians, 8 Americans, 10 Aussies or 20 Brits for an entire year. Last year we wrote about how Bitcoin Mining Was Now Consuming More Electricity Than 159 Countries (update here) and The Estimated Electricity Cost Of Mining One Bitcoin By Country. A lot has changed over the past 12 months. For starters, Bitcoin is now worth “only” $6,338, far below it’s peak at $19,962 in December of last year. However, one thing that hasn’t changed is that Bitcoin mining continues to use huge amount of energy, although the rate of increase has more or less stalled due to the lower price. Based on the Bitcoin Energy Consumption Index (criticism of it can be found here), one single transaction now consumes an estimated 819 KWh of electricity, enough to power an average US household for 27 days or for many people around the world more electricity than they’ll use in a single year. Based on Quandl’s data for September 2018 – there were 1,436 transactions per block and each block generates 12.5 Bitcoins. This means that mining one Bitcoin coin currently uses an estimated 94,000 KWh of electricity ([1,436 transactions * 819 KWh per transaction] / 12.5 Bitcoins per Block). To put that in perspective, that is 2X what an average Icelander will consume in a year or 6X an average Canadian, 8X an average American, 10X an average Aussie or 20X an average Brit. 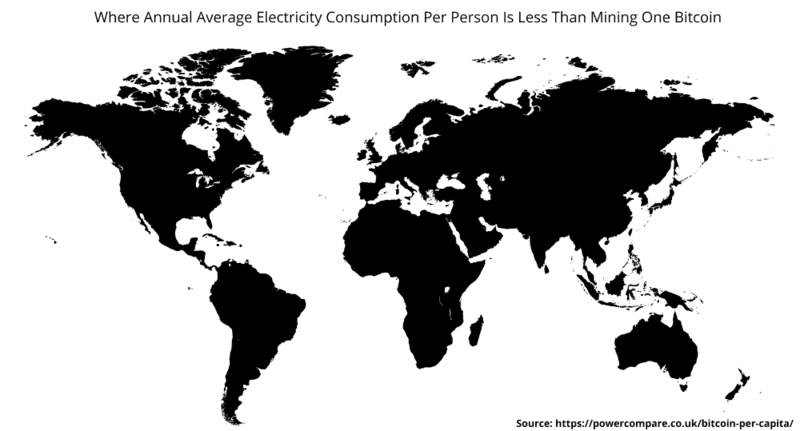 Here’s a map showing Where Annual Average Electricity Consumption Per Person Is Less Than Mining One Bitcoin (Hint it’s every country in the world). And in case your’re curious here’s a full list of countries by per capita electricity usage. There are two important things to note about the data above. First, is that we’ve used the Digiconomist Bitcoin Energy Consumption Index, which has it’s critics. We won’t go into them here, but just keep in mind they are providing an educated estimate. The second is that electricity consumption per capita data comes from Wikipedia. This means most of the data is a couple of years out of date and comes from a variety of sources. Moreover, the numbers here represent the total amount of electricity consumed in a country divided by the population. Thus, it includes not just electricity used in homes but also offices, shops, factories, etc.